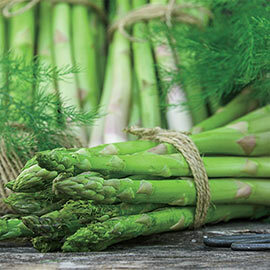 AsparaBest Asparagus | Henry Field's Seed & Nursery Co. Produces up to 3 Times More Spears! Harvest lots more spears—without sacrificing flavor. AsparaBest truly lives up to its name! Its predominantly male plants produce little to no seed and 2 to 3 times more spears than popular Jersey varieties. And, the purple-tipped green spears have an excellent flavor. Developed at an Ontario, Canada University, the late-emerging AsparaBest is unmatched for cold tolerance, but regardless of your climate this delicious variety will produce longer than all other asparagus varieties on the market! Zone 3 - 8 (2 with Winter protection). Height 3 to 4 feet. For each offer ordered, get 10 Medium grade plants. Spacing: 12 - 18 inches apart. Depth: When planting bareroot crowns in the spring, prepare a trench 8 inches deep. Spread crowns over the soil and cover them with 2 inches of soil. Gradually fill the trench with soil as the plants grow (if your soil is clay or heavy, you should add compost. Soil Requirements: Suited for almost all soil types found in home gardens. Pruning: Cut the ferns down to ground level in the Fall once they have turned brown, or in the early Spring before new growth appears. Fruit: Purple tipped, green speared asparagus. 10 - 12 inch spears.